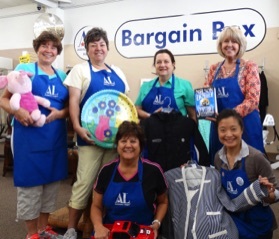 Our thrift store is a one-stop shop staffed by friendly member-volunteers of Assistance League of Arcadia, where one-of-a-kind items are always available. You are sure to find great bargains on new and gently-used clothing, household items, luggage, dishes and glassware, linens, bedding, furniture, towels, etc. We have a “Best of the Box” boutique and beautiful jewelry on display. The first Wednesday of November, we hold our amazing annual Holiday Sale. It is our biggest fundraiser of the year. We gladly accept your gently used clothing, household items, books, and magazines. All proceeds from Bargain Box sales, donations, and grants are used to fund our philanthropic programs. We are here to welcome you! Very clean and organized! They have such nice helpful people who assist you. And they are volunteers!!! I look forward going there and seeing all the bargains, all the nice ladies and knowing the proceeds are going to a good cause!! 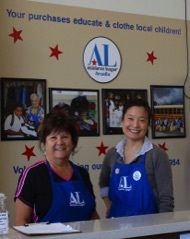 The Bargain Box is run by the Assistance League and they are a wonderful organization. They assisted my daughter who is a student in an Arcadia elementary school and they truly deserve donations and purchases. If you want to see your money put to good use, donate here. Click Here to sign up for Weekly Sale Notifications. The first Wednesday of November we hold an amazing Holiday Sale. The entire store is transformed into a Holiday boutique with new gift items, holiday decor, holiday clothing, toys, games, stuffed animals, dishes, etc. Our customers line up in the wee hours of the morning to be the first through the door. Our volunteers are an artistic group who proudly refurbish and redecorate all donations. All of our treasures are in beautiful condition.